Many service providers are now looking to extend the offerings to include data protection. Regulatory compliance requires companies and providers to secure data especially personal identifiable information (PII). Thus, the need for data detection engine that will scan data accurately and report the presence of sensitive content inside files or streams. GTB SDK includes a detection engine that is file format independent. The system does not require knowledge of the beginning or the end of a file before it starts scanning. Therefore, a countless number of file types are supported including binary files. GTB SDK has an option to include OCR. This adds the ability to detect images in more than 75 languages. It is smart enough to detect data inside images even if these images are embedded in files. The GTB SDK supports UTF-8 including double byte characters and right to left languages. So, all languages are supported allowing support for customers world-wide. The GTB SDK utilizes RESTful API interface that accepts HTTP POST requests from the Calling Service/App and returns a result in JSON format. The GTB SDK is multi-threaded. It supports close to 1GB of bandwidth for one machine. Providers with higher capacity may deploy multiple machines to accommodate more traffic. The GTB SDK includes more than 300 DLP Detection Categories for full compliance. Providers only need to include Detection Category in the Post call. The system shall detect all policies in the data stream or the file. The GTB SDK includes a Dashboard for configuration and settings as well as Policy Management. The system supports full REGEX utilizing Perl Scripts. Providers may customize DLP Policies for specific categories of their customers. to accurately capture, recognize data and manage files for both structured and unstructured data. GTB's patented, Intelligent Detection Engines do not require knowledge of the file type, does not require the location of the beginning of the file nor its end in the data stream. Utilizing patented, "on the fly" real-time content inspection, our intelligent proprietary data engines identify sensitive data of interest with nearly 100% accuracy, without network or host degradation. In addition, a pattern engine with pre-built compliance tables, lexical analysis and extended regular expressions is also available. Your system submits files for inspection and the engine responds with any data violation it finds. You may then enforce your own policy in real-time. 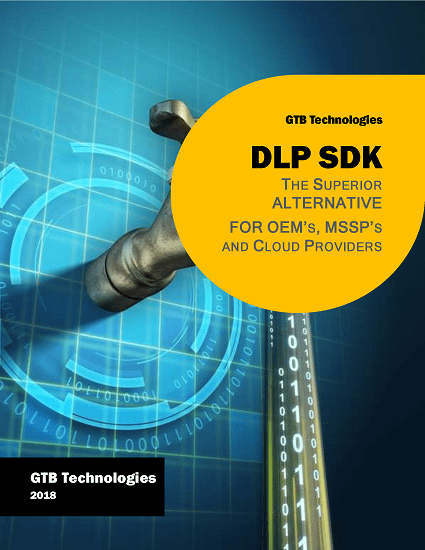 Whether it be messaging gateway services, web monitoring, cloud services, mobile devices, email and smart encryption, data eDiscovery for EIS, file backup service, document management services, ERP, MDM, CRM, anonymization, etc..; Organizations, MSSPs, Cloud providers and OEMs can now use GTB's SDK without the use or expense of 3rd party file cracking tools, to instantly provide accurate visibility to their products the necessary functionality required to provide data security. GTB offers a 30-day trial. Providers may test the system with its full functionality. Priced at per user per year. The more users you have, the lower is the price per user.